The Downtown economy has already fully recovered from the 9/11 attacks and the financial crisis, but the best is yet to come for Lower Manhattan, according to a new report. Private-sector employment reached a post-9/11 peak at the end of last year, in a more diversified Downtown economy that relies less on the financial sector and serves a fast-growing residential population, setting up an expansion expected to exceed growth in the rest of the city over the next five years, according to “Surging Ahead,” a report put out by the Alliance for Downtown New York. “We have built back bigger, better and stronger,” said Alliance president Jessica Lappin. In 2001, Downtown’s economy was dominated by the so-called “FIRE” sector of finance, insurance and real estate, which provided 55 percent of all private-sector jobs in the area. 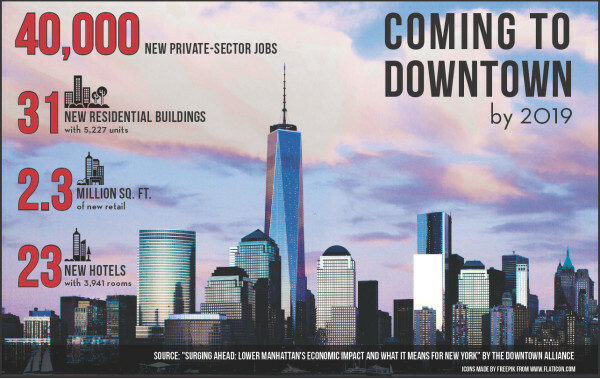 The flight of such firms after the 9/11 attacks, followed by the crash of the sector following the financial crisis eliminated more than 50,000 Downtown jobs. But over the same period, growth in other industries in Lower Manhattan made up for most of those job losses, creating a more resilient and diversified employment base. As of the end of last year, Lower Manhattan depends on the FIRE sector for only 35 percent of private-sector employment, with a much higher proportion of jobs coming from growth industries such as health care, professional services and the hospitality sector. In fact, one of the fastest-growing segments of the Downtown economy is that new darling of economic development circles, the so-called “TAMI” sector made up of technology, advertising, media, and information-services firms. The start-up-heavy TAMI sector leased 3 million square feet of office space Downtown between 2009 and 2014 — more than enough to fill the entire Empire State Building — and increased its employment in the area by 37 percent to account for nearly 10 percent of all jobs Downtown, according to “TAMI Takes Lower Manhattan,” a 2014 report by the Downtown Alliance. And that trend will continue. More than half of the sector’s 2014 total footprint came from leases signed for more than 1.6 million square feet in that year alone, and TAMI firms are on track to ink leases for nearly that much new space in 2015, according to the Alliance. Manhattan overall has seen a surge in this coveted tech-media sector since 2007, but the Downtown Alliance report showed that Lower Manhattan has become its center of gravity in the city. Of the nearly 9 million square feet of office space TAMI firms leased in Manhattan between 2007 and 2010, only 14 percent was in the Downtown area. But of the nearly 15 million square feet of space leased from 2011 to 2014, 32 percent was located south of Chambers street alone. The growing list of major media companies moving Downtown includes Time Inc., Condé Nast, Harper Collins, SNY, and the New York Observer, with Vox Media, News Corp. and 21st Century Fox now in talks to lease space. “The center of gravity has definitely shifted Downtown for media,” Lappin said. But the diversification of the Downtown economy away from the financial sector isn’t simply a matter of swapping one dominant sector for another. The latest Alliance report cites growth in other areas which point to a more balanced economic base, and promise continued expansion. Downtown added 14,772 new residential units between 2001 and 2014, and is expected to add another 5,277 units — mostly luxury condos — by 2019. The hospitality industry has added 3,439 new rooms in 16 new Downtown hotels since 2001, and is projected to add another 3,941 rooms in 23 new, mostly high-end boutique hotels by the end of the decade. Downtown’s newly diversified economy and booming residential population is turning Lower Manhattan into a 24/7 neighborhood set for accelerated growth that will outpace the rest of the city going forward, the report found. New improvements in the area’s transportation infrastructure — both recently completed projects such as Fulton Center, and those still anticipated, including the World Trade Center hub taking shape beneath the Oculus — are expected to power the continued expansion of the Downtown economy, drawing shoppers from across the city and around the region to new shopping destinations soon coming online. Retail components of the transit projects, plus shops in new the World Trade Center complex and elsewhere — including a new Target store set to open next year in Tribeca —will add more than 2.3 million square feet of retail space in Downtown by the end of 2019. This 53-percent increase in retail space is expected to add more than 4,000 new jobs. In fact, employment in Lower Manhattan is expected to increase by 2.4 percent a year through the rest of the decade, nearly double the 1.3-percent rate estimated for the city overall, according to Appleseed, an economic consulting firm that contributed to the Alliance report. Downtown is projected to add another 40,000 private-sector jobs by 2019 — the area’s biggest upsurge in employment in the past three decades. And while many of the 27,000 jobs gained by Lower Manhattan since the depths of the Great Recession came from companies relocating from other parts of Manhattan to take advantage of office space vacated by a downsizing financial sector, the changing Downtown economy means that the majority of this future employment increase will be net new jobs for the city, according to Appleseed.